Wreckless was one of the first Xbox games to truly demonstrate what the machine could do. Littered with many special effects, lighting and high resolution textures, Wreckless was a showpiece for someone to show off their Xbox. 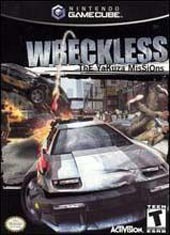 But Wreckless this version of Wreckless shows how much the Xbox release relied mainly on it's graphical flair. When you take away all the glitz and glamor, you're left with a game that can be fun, if not for some of the inconsistencies it has problems with. The main plot of Wreckless is actually divided into two stories that involve the Yakuza mob. You can either play as the Flying Dragons or a couple of spies. The Flying Dragons are in a way like bounty hunters. They really don't seem like they're tied to a criminal enforcement agency, but the police really never go after them for wreckless behavior (pun?). And as for the spies, you really never get the idea that they are spies until a few missions into the game. Their opening cinematic scene shows them talking about stealing all the Yakuza have. The focus of this game seems kind of askew. It's like they mixed elements of SpyHunter with the insane pace of Crazy Taxi. The missions of the game are fairly different for each group. You'll have to race opponents, destroy cars, steal back certain items, take some pictures of a person and so on. And before you start the mission, it seems pretty easy on what needs to be done. But that's where things get complicated. The arrow that is supposed to guide you is useless half the time, it just wanders to where the goal is, but not how to get there. The map is about as useless, since you can't see the whole map, you only get a chunk of it, and it doesn't display everything, like checkpoints. But those small elements really only play a part of the hindrance you'll encounter in the game. The overall design of the game seems cluttered. You drive around in a cramped city setting with cars EVERYWHERE. This game has the worst traffic I have ever seen in a video game. Littered with cars, there's really not much room to make a clear line in the road. Add the fact that some drivers are just really stupid, and you've got problems. It's hard to complete some missions due to the excessive amount of traffic. If there's a mission that calls for not damaging a particular item, how is this possible when you can't drive past a car? Sure, you can push it out of the way with a missile, but that makes things worse. Speaking of missiles, you have a small bit of arsenal at your disposal. About 8 missiles and 3 "Adrenaline Boosts", and while the missiles help a little, the Adrenaline Boost is not really a boost at all, it just slows down the pace of the game (for why?). And you can't replenish your inventory at all. Use all the missiles, and that's it. Then you're left to using your car. And here's something odd, your car does not take damage! In a game like this, it does make life a little easier, but with so much you smash into, you would think it would slow down, at least. As for how the game handles, it handles better than I imagined. Some places said the controls were poor, but for some reason I had no trouble at all. It is fairly loose, kind of like Cruisn' USA's handling, but I never really had problems with it. The visuals of the game can best be described as average. The texture work, while not utterly horrible, is not nearly as nice as other GCN games. You play this, then you play Burnout 2, and you'll notice a difference. I guess you can blame some of the diminished texture quality on the huge city environment, since there's just so much to place a texture on. But then again, the Xbox could pull this off effortlessly, and with effects to boot. I'm sure if there was some extra attention on porting the game, it can look very close to the Xbox version. I know the GCN can pull off better. Basically, it looks like an average Dreamcast title. The sound effects are not thoroughly stunning either. Theres a lot of tire screeching, crashing noises and explosions, but they seem to have been sampled at a slightly lower rate. The music is pretty average, and the voice acting is comical at best. When you put so much emphasis on graphics, you really forget about game play, and Wreckless is a perfect example of this. The game looked great on the Xbox, but when you get down to the design and game play of the game, you're left with something that seems cluttered and a bit incoherent. If you have an Xbox, it's best to go with that version as it does look better. On any term, however, Wreckless is best as a rental, but even that's a tough recommendation. Ugly, annoying and just not that fun, Wreckless is a lifeless port. What? Could there actually be something better than this?